2018 is coming to a close soon, and when it comes to planning your travel goals for the next year, it's never too early! 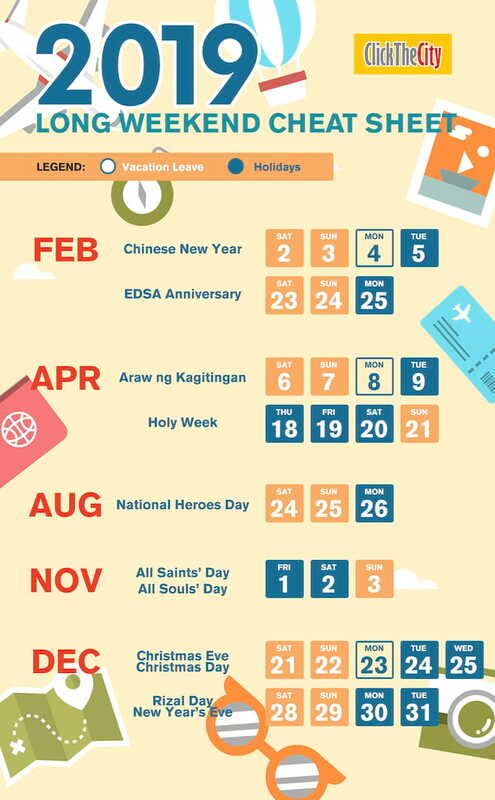 We've plotted all of 2019's long weekends based on National Holidays and the official government proclamation, so that you know which days to file as your official vacation leaves. Get a headstart in rounding up your travel crew for your next roadtrip or flight! Long weekends will be easier with this cheat sheet, as we round up the holidays falling on a Monday, Friday, or Tuesday and Thursday (so you can take one vacation leave in between!) to make the long weekend possible. Bookmark this page, save the calendar to your phone, print, and share with your friends!